Would be nice to see a little bit more contextual information about these items (I’m sure they don’t call them “boots” or “footwear” in Mongolia. How do they differ from other styles and what about their craftsmanship links them with royalty? )–rather than hearing about wealthy Westerner’s travels in Asia. Is this the 19th century? I feel rather sorry that these left Mongolia. Many thanks for taking the time to make a comment. I can understand your frustration at not getting more information about the Mongolian footwear in our blog; however, this blog is about multicultural events in Toronto, not about footwear. You might be interested in seeing a slide-show that I gave at the Bata Shoe Museum. It is posted at the Virtual Museum of Asian Canadian Cultural Heritage: http://vmacch.ca/Museums/BataShoeMuseum/malloy.html. It gives more information about Mongolian boots. 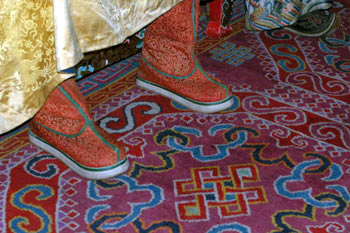 I also published an article in the Globe and Mail in 2006: Walking a Mile in Mongolian Shoes. You can find it on: http://www.ruthlormalloy.com/mongolianshoes.htm . You do bring up a controversial point. Should national treasures such as royal boots be kept in their country of origin? If you were to go to Ulaan Baator today, you would find many wonderful historical artifacts in its several excellent museums as you can see in the above slide show. But not every Torontonian can go to Mongolia, nor is interested in Mongolia – or, alas, in the rest of the world for that matter. I do feel it is important to have a few examples of other cultures readily available in museums abroad. It helps us appreciate other civilizations. We are fortunate in Toronto to also have living representations of these other groups in their architecture and on our stages. We can see their folk dances, music, theatre, and enjoy their unique foods. Our school children can examine for themselves what royalty in Mongolia and India once wore. They can look at world-famous Chinese artist Ai Wei Wei’s sculptures in our city hall square. They don’t have to go to Sri Lanka to see a Hindu chariot festival or to the Azores to see a bull fight. These are what this Blog is about. Ruth. Tactful response as well as informative links. Well done, Ruth!